Just like spring, a new public conversation is busting out across the nation and the topic is health insurance and health care affordability for patients and consumers. The conversation is taking different forms and is beginning to trigger policy proposals. More will come – and when it does, this conversation may well become a charged debate. Cost Sharing: The first stream involves the growth of deductibles, copayments, and coinsurance, especially deductibles, aimed at consumers. This past week, the Commonwealth Fund released a new Issue Brief showing that 23% of adults with health insurance, 31 million, had “such high out-of-pocket costs or deductibles relative to their incomes that they were underinsured.” About 11% of privately insured adults have policy deductibles of $3,000 or more, up from 1% in 2003. Half of these underinsured (51%) “reported problems with medical bills or debt and more than two of five (44%) reported not getting needed care because of cost.” Fully 41% of adults with high deductibles had debt loads of $4,000 or more. Fully 75% of all consumers now have deductibles on their policies — so if you’re part of the remaining 25%, be grateful! What about the Affordable Care Act – wasn’t that supposed to fix this? Yes and no. Yes, because for the first time, under the ACA, there is a real limit on consumer cost sharing. It is the allowable limit for so-called “Health Savings Accounts” – high deductible policies that many Republicans like and promote. The 2015 limits are no more than $6600 for an individual policy and $13,200 for couple/family coverage. Not so affordable, right? Still, a new Urban Institute analysis shows some good news: 9.4 million fewer families experienced a problem paying medical bills between September 2013 and March 2015, a drop from 22.0 to 17.3%. So mixed news with signs pointing in both directions. Millions of Americans now getting Medicaid through the ACA – with incomes under 138% of the federal poverty line (less than $15,654 for a single person in 2015) – are subject only to small copays and no deductibles — though there is still underinsurance among this group because relatively small cost sharing can still put a sizable dent in a low-income person’s finances. Also, folks with incomes between 138 and 250%fpl (up to $29,425 for a single person) have strong cost sharing protections through their ACA subsidized policies. For everyone else though, the only protection is the HSA limit – and for many, that’s unaffordable. 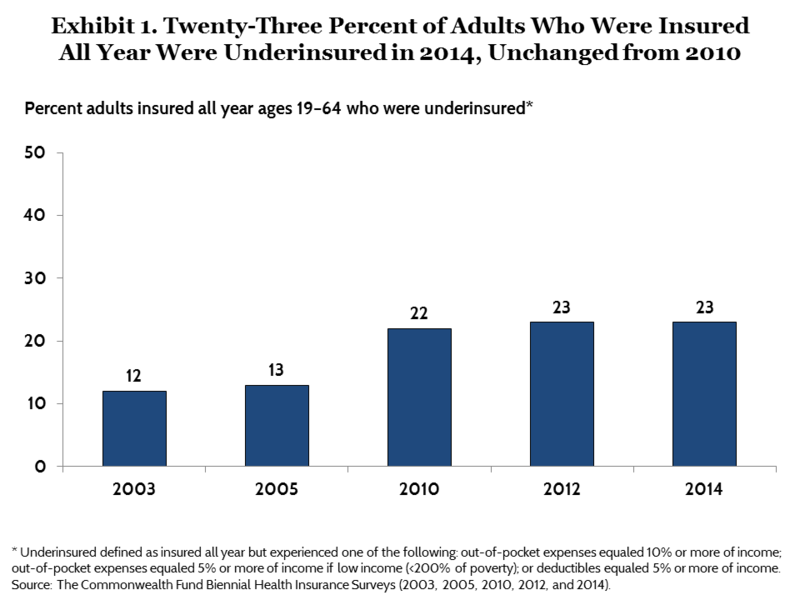 Look below and see that the percent of adults meeting the Commonwealth Fund’s definition of “underinsured” has been stable since 2010, and that the major growth occurred between 2003 and 2010. 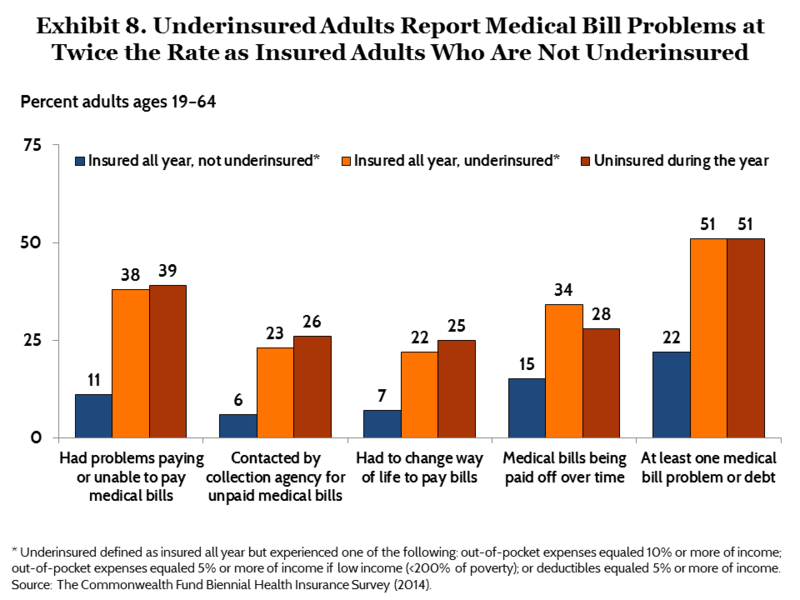 Below is the key chart showing the significance of underinsurance in terms of people’s ability to get needed medical care – 44% of underinsured Americans report at least one cost-related access problem (see chart below). Also last week, the consumer organization Families USA released a report based on Urban Institute data showing the as many as 1 in 4 insured American adults skipped needed medical care last year because they could not afford it. This is a real problem that needs attention. Surprise Billing. The second stream involves hospitals, physicians and other medical providers who are surprising consumers with shockingly high out-of-network bills and charges after medical care is provided. I gave an example of this in an earlier article last month. Take a look at this excellent new essay in the Atlantic Monthly by Olga Khazan, “The Agony of Medical Bills,” to put a human face on this trend. Not only are consumers being hit with surprise bills they had no way to anticipate, but the charges imposed on them can rise to more than 100 times the amount Medicare reimburses providers for the same service, according to a survey by America’s Health Insurance Plans. 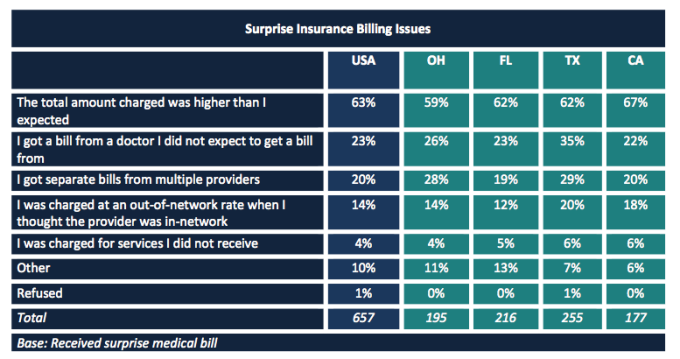 Earlier this month, Consumer Reports released data showing that 1 out 3 privately insured Americans report having received a surprise medical bill within the last two years (see chart below). States, including New York, are considering and passing new laws to protect consumers — how effective these will be remains to be seen, but it’s a move in the right direction. Imagine going into a restaurant and getting numerous separate bills for your meal — different ones for the waitstaff, the water, your table, the different courses. And imagine if you didn’t know what the bill would be until it arrives? That’s the increasingly insane world of hospital billing these days as experienced by many consumers. All in all, it points to real affordability problems for many moderate and middle income Americans. What can we do? More state-based marketplaces should design standardized plan offerings (plan designs that participating insurers are required to sell) that have lower cost-sharing for primary care, other outpatient services, and prescription drugs. Congress should provide cost-sharing reduction subsidies to middle-income consumers and increase the generosity of this help. Also needed are recommendations for what can be done to protect consumers in employer sponsored coverage — a population taking on high cost sharing burdens. Of course, affordability is also an issue for an estimated 4-6 million low-income persons in states refusing to expand their Medicaid program. And affordability is a challenge for moderate income Americans stuck in an ACA dilemma called the “family glitch.” For workers who are offered unaffordable employer-based health insurance, affordability is defined for the individual worker without regard for the family cost, leaving an estimated 2 million in a painful coverage gap. So when it comes to affordability — the first question is, for whom? It’s a widespread issue that affects many vulnerable Americans in different ways depending on their income, state of residence, employer, family size, and more. The 2016 conversation about health care is starting to take shape in some new and unexpected ways.